A pretty cover and an original idea should be the basis of a great book. Unfortunately, Ticker failed to make my expectations come true. After requesting this title I started to see a flow of negative reviews coming in. However, I was not discouraged by them and hoped that I would enjoy it more, as I usually quite like steam punk. The original idea was indeed really interesting, but I also have some problems with the book. It wasn't one of the best books I've read but neither so bad as the one star ratings the book is receiving. I admit it was quite of a slow start, but I tend never to give up on books and I felt like it became better. You're just completely thrown into the story at the start that I didn't have a clue as what was going on and why, and who are all these characters anyway? Penny has a bad heart. To stop her from dying, surgeon Calvin Warwick invents a mechanical heart for her. 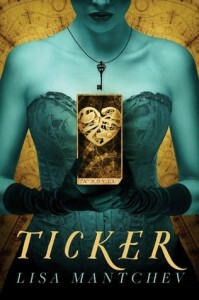 At the beginning of the book Warwick is on trial for his life after it has been discovered that he experimented on (and killed several) humans to create this 'Ticker'. It's really weird, but all the while it felt as if I was reading the second or third instalment in a series rather than a standalone. There's so much reference to the events leading to the ticker being installed in Penny that it feels like there's a book about it I should have read. But according to my best knowledge it truly is a standalone novel. (I normally really appreciate if not everything is spit out literally in a story, but this just made me feel lost and was confusing). Probably this was why I didn't connect with any of the characters and the world didn't feel real (or very steampunk for that matter; it was just loads and loads of metal basically). I'd liked to get to know more about the back story, since that seemed really interesting. The story in Ticker was okay but not as special or original as I had hoped. You must be wondering now why I wanted to give this book 2.5 stars, but it's because despite the fact that it obviously has quite some flaws I did for one reason or another enjoy reading it.